Spend the full day enjoying personalized attention while you sightsee, shop, and eat a Sri Lankan lunch. Stops can include Independence Square, Galle Face Green, and the Gangaramaya Temple before spending some free time shopping for souvenirs. A traditional Sri Lankan lunch at a local restaurant is included. Hotel pickup and drop-off included. We took a private tour in Columbo. I use a mobility scooter, but am able to walk short distances,which was not a problem. The guide was extremely helpful, realised my limitations, and gave us a great tour accordingly. We visited 2 temples, and had a city tour. We than had lunch. We then negotiated to extend the tour to Galle, where we saw the fort, the fishermen on stilts, and the amazing turtle sanctuary. Our guide was informative, kind, courteous and polite throughout, cannot recommend him enough. Thank you. 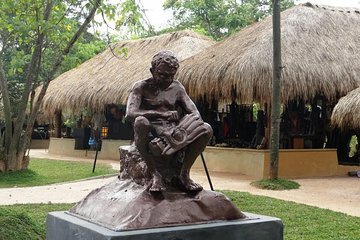 Highly recommended tour if you have a short time in Sri Lanka. It allows you to see temples, go shopping for souvenirs and gem stones, and enjoy Sri Lankan buffet lunch at Rajabojun Grand Buffet. My guide and driver Subhash took time to explain details of the temples and the history behind century old buildings including religious symbols and traditions.